Klau Geomatics, which focuses on developing UAV PPK solutions, released new survey technology for drones and manned aerial mapping, ultimately designed to provide highly accurate autonomous flight. The company explains its Real Time PPP (Precise Point Positioning) enables 3 to 5 cm initial positioning accuracy, anywhere in the world, without any base station data or network corrections. “Just as Klau Geomatics led the industry from RTK and GCPs to PPK, we now lead the charge to PPP as the next technology for simple, accurate drone operations,” said Rob Klau, director of Klau Geomatics. The new PP technology allows operators to navigate with real-time, centimetre-level positioning or to geotag mapping photos and Lidar data. The technology, according to Klau Geomatics, is very applicable to surveying, mapping, navigation and particularly the emerging drone inspection industry, where accuracy is essential to analyse change over time in 3D assets. 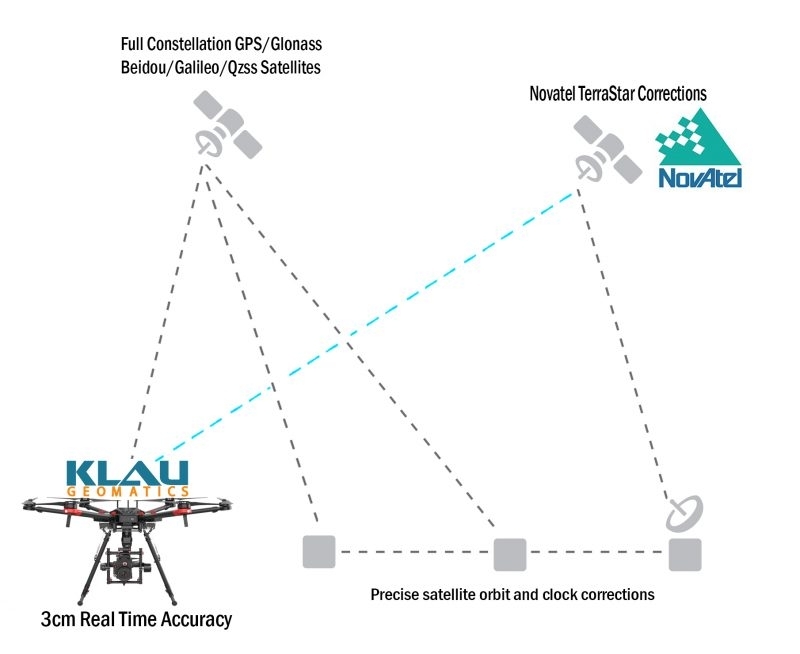 Klau Geomatics’ new satellite-based positioning technology leverages NovAtel’s PPP technology to achieve this advance in location accuracy. This hardware/software bundled system, expl;ains Klau Geomatics, enables accurate positioning in any published or custom coordinate system and datum. Using the new technology, Klau Geomatics explains BVLOS parcel delivery drone can travel across a country and arrive exactly on its landing pad, without range limitations, base station requirements or radio links. As well, the company explains large-scale enterprise drone companies can deploy their fleet of operators with a mechanical workflow to capture accurate, repeatable data, without the complications of the survey world, such as needing RTK radio links and network connections or logging base station data within range of each project.